VENTURES AFRICA – A dispute has broken out between the Ghana government and its Jubilee Partners (partners working in the country’s largest oil field) over the implementation of the Tweneboa, Enyina and Ntumme (TEN) oil block project in the Western Region. Whereas the government demands the Jubilee Partners to drill the Ntumme well for the former to fully assess its commercial viability and risks for the project before approving the Plan for Development (POD), the latter insists the project has enough economic value for which it should be approved. Reports indicate that the Jubilee partners have already spent $1 billion on the project and after the approval is granted, the will have to sink a further $6billion on it. The field is reported to hold about one billion barrels of oil reserves and when it comes on stream, it is expected to produce 100,000 barrels per day. The government was making this request as it wants to protect the national interest and also to avoid the technical difficulties encountered by the partners during phase one of the project, according to officials of the Ministry of Petroleum and Energy and the Ghana National Petroleum Corporation (GNPC). 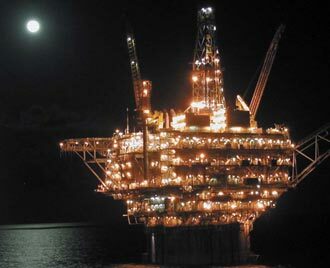 The officials argued that those technical errors accounted for the country’s inability to achieve the 120,000 barrels per day (bpd) of oil production it had targeted when Ghana commenced commercial oil production. The country was thus forced to incur additional cost in remedial technical works before the current 115,000 bpd was reached. Since Ghana commenced commercial oil production in 2010, production has hovered around 80,000-90,000 bpd until the technical challenges were rectified last year before production inched up towards the targeted 120,000 bpd. This led to reduced oil revenues and lowering of expectations among Ghanaian’s who had expected so much from their oil sector. In an interview with Ghana’s Daily Graphic newspaper however, an official speaking on anonymity on behalf of the Jubilee partners denied this accusation, saying the delay in approving the POD was costing the nation more. The official revealed that the POD for the TEN project was submitted to the government in November last year and that tender processes for the construction of the project’s Floating, Production, Storage and Offloading (FPSO) vessel and others will be awarded as soon as the approval was granted. Government officials are however adamant that the TEN project will not be rushed as “Ghana has learnt a lot from the past mistakes and we know the GNPC will always object t anything that will work against the interest of the country. If we fast-tracked the Jubilee we must be careful with the TEN project”. A government official further told the newspaper that “we must take our time. When we rushed the first one, they went to rent the expensive rigs which played to their advantage; local content was thrown to the dogs; we have simply learnt and we will look for the best POD”. The Jubilee partners include Tullow Oil, Kosmos Energy, Anardarko and Sabre Oil and Gas which sold its stake in the Jubilee field last year to South Africa’s PetroSA. NPA Ask For Tema Oil Refinery Privatization. GE To Invest Billions Of Dollars In Fracking . Has the gold rush come to an end?